Have you ever wanted to know more about grammar and effective writing? Well, you’re in luck, because the book about exactly that will be with you September 15th! 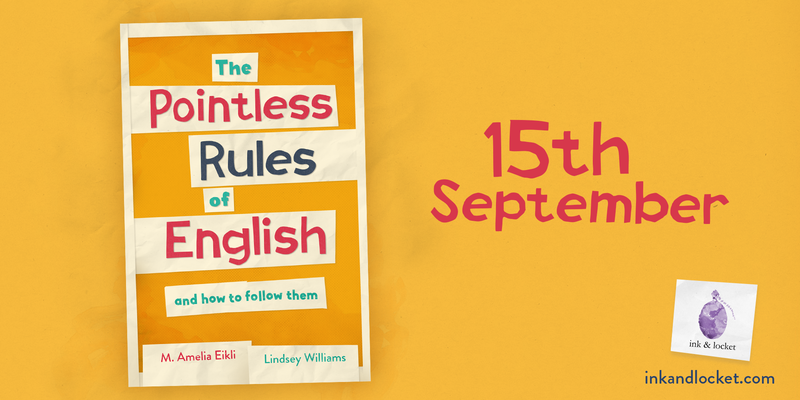 Since our first update, it has undergone a name change, but The Pointless Rules of English is almost ready for your bookshelves. This book is a collaboration between author, translator and writing coach M. Amelia Eikli, and editor and reluctant internet person Lindsey Williams. They’ll take you through the history of the English language, tell you all you need to know about grammar, and give you some great tips on improving your own writing – from quick lessons on building strong sentences to a whole section dedicated to writing inclusively. Coming up, we’ve got a livestream where the authors will talk about the book and answer your questions (date to come! ), and not one, not two, but three release parties. On Saturday 15 September, join us in London for the launch celebrations. On Saturday 22 September, Amelia will celebrate in Bristol while Lindsey celebrates in Manchester. Details of all three parties to be confirmed soon, so watch this space. We hope you’re as excited as we are to see this book out in the world. The Unlock-it Guide to Grammar and Better Writing! The book will be released on 12 June, available as an ebook and paperback. It aims to be an approachable yet detailed introduction to grammar and a helpful guide to better writing. It will offer easy ways to improve your writing, a guide to academic essays and papers, and a whole chapter on inclusive writing. That’s right! In addition to clearing up once and for all when (and why) you should use ‘who’ and ‘whom’, the guide will provide tips on how to write inclusive copy, how to deal with teachers who won’t let you use ‘they’ as a singular pronoun, and why writing ‘trans*’ is more than just a matter of punctuation. This book is a creative collaboration between Lindsey Williams and M Amelia Eikli. Lindsey Williams is a magazine editor and linguist living in London. She is also an active “internet person” who regularly tweets about food, books, social justice and happy dogs over at @pottermoosh. Does the username sound familiar? You may know her from her YouTube channel, where you can get a sneak preview of her love for language. M Amelia Eikli is one half of the team behind Ink & Locket Press, a linguist, and a passionate creative-writing instructor. If you want a taste of her voice, you can find her over at her newly launched writing hub, Storywelling or on Twitter. She has been on just about every side of the publishing industry and has a passion for language that borders on the dangerous. Are there any topics you hope the Unlock-it guide will cover? Let us know in the comments below! This question pops up with high frequency, and is almost exclusively finished with some combination of the following words: straight, white, people and men. Somehow, our focus on diversity in fiction is often perceived as harmful and discriminatory. Harmful towards the freedom of speech; discriminatory to those whose stories we do not aim to publish. When I grew up, I recognised myself in every book I read. I read about families like mine (mum and dad, brother, sister) who looked like me (white, blue eyes, two arms, two legs), who celebrated the holidays I celebrated (Christmas, Easter, summer vacation), and did the things I liked to do. My family is a book-loving one, and by the time I was 12, I knew I could become just about everything, do just about everything, and that I was normal and fine and interesting. I only had to find myself a prince, and life would be grand. None of my childhood books prepared me for the idea that I might fall in love with a princess. If I have children, they will very rarely see families like their own (two mommies) in their books. And if they are born with a disability, or lose a limb, or struggle with mental health, or are of colour, most of the heroes they will find in their books, and in the wider media they consume, will not look like them. 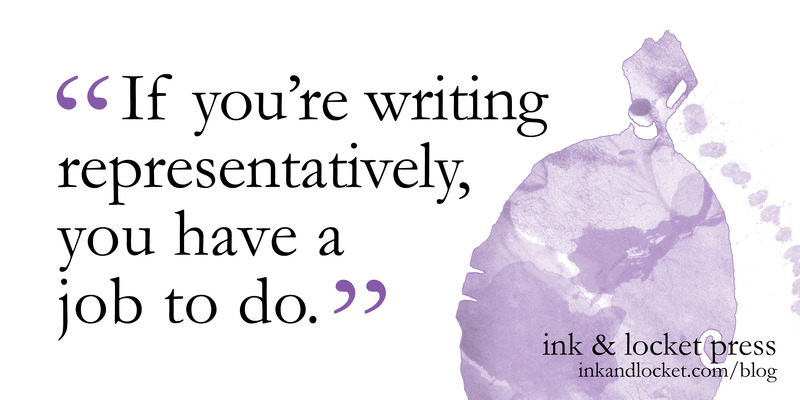 Ink & Locket Press seeks to publish against the traditional publishing bias. The traditional bias leans towards publishing and highlighting stories by and about men (especially white men), straight people doing ‘straight things’ and white people doing ‘white things’. We are not seeking to eliminate or change these stories. A large portion of the market wants these stories and should have easy access to them. But we’re working towards everyone having easy access to stories they can identify with, and towards every voice with a story getting the opportunity to be heard. We are not here to discriminate against male authors. Male authors who are queer, who are of colour, who are trans or who have a disability—you are all welcome to submit to us. Likewise, we do not discriminate against straight authors, nor white authors: we just want stories that focus on other things. When it comes down to it, though, we are not even discriminating against straight, white men who write stories about straight, white men. We are just not actively striving to tell those stories. Those stories are already being told, have been told for hundreds of years, will be told for hundreds to come, and every big publishing house in the world will consider those submissions with a favourable bias. And we will gladly read them, and support the authors, and participate in good literary debates about their works and legacy. Those stories and authors are simply not our focus. We want every child to grow up knowing they can become just about anything, do just about anything, and that they are good, and fine, and interesting. Where is the harm in that?